This entry was posted on April 25, 2010, in Boston University. Bookmark the permalink. In my first year at BU, the Theatrelab has risen to the top as my favorite performance space to work in. Dirty, broken, acoustically poor, and inhibited by enormous cement columns both on stage and in the house, the space appears to be a nightmare. As such, it is relegated to student shows with little to no budget and skeletal crews. But herein lies the magic – when the crew is passionate, it doesn’t matter how much money or support you do or don’t have. You create, you experiment, you work outside the boundaries and you work as a team all the harder because your own efforts are all you’ve got. My most recent endeavor, a production of Ionesco’s The Chairs, opened this weekend. 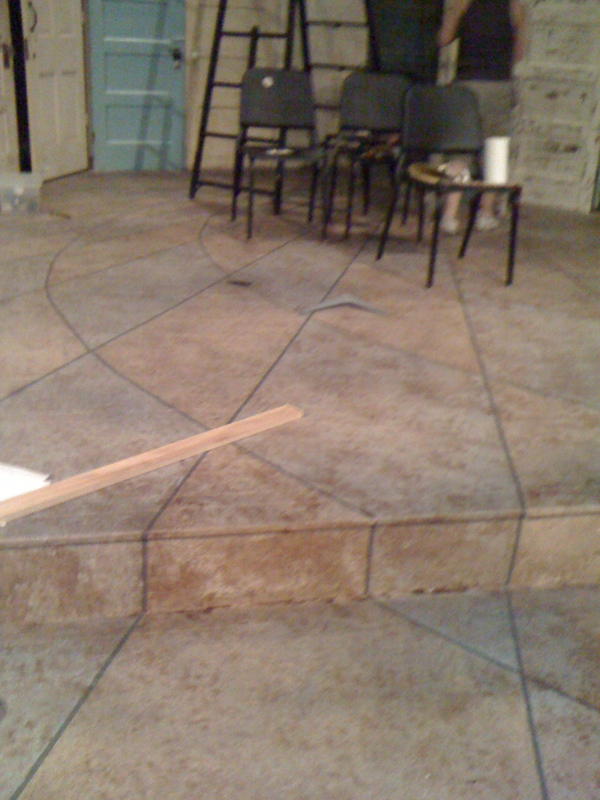 The process of getting there involved the set designer picking up a dozen free doors from around the city, learning to brace them on each other to create walls, and the meticulous process of shiming and wiggling them into place so that the ones that were supposed to open opened, and the ones that were supposed to stand up stood up. Though I was brought on to the project as the production manager, I spent a lot of time behind, beside and under the set with Bessie, my drill/driver, behaving like the TD. And then there was the paint. The floor treatment, completed a few days before load in, had everyone “wow-ing.” Then the doors went up, and the “distressed” treatment had them wowing again. 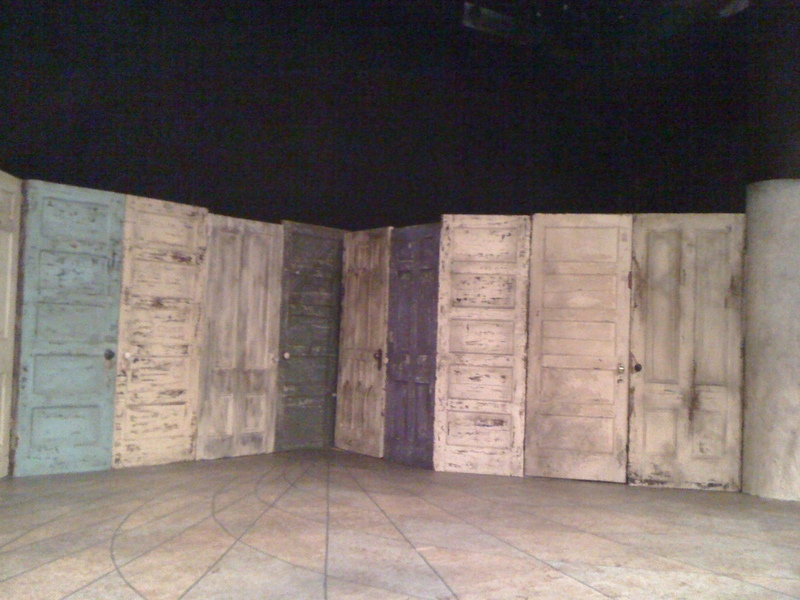 When the set designer told the lighting designer that she wanted one of the upstage doors painted purple, I thought the LD was going to faint. But in the end the door became purple and the lights were tweaked and everyone was happy – more than happy – it looked great! All of this – doors, walls, windows, paint, lighting, costumes – for what was pitched to us as an “unsupported” show, a show with no staff and no budget. What this actually translated into was an incredibly passionate volunteer team who stayed late after rehearsal, dropped in between classes, squirreled away pocketfulls of screws, and invested their own money in the project. 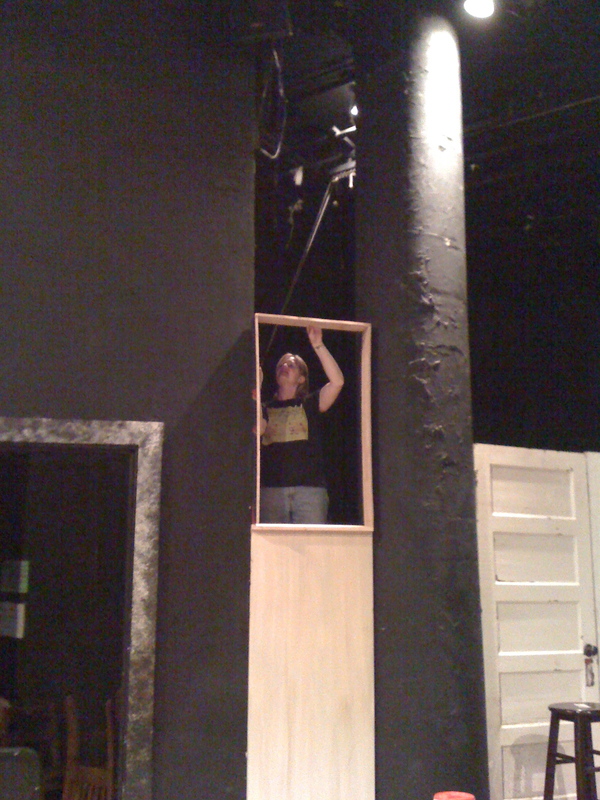 For me, this is the magic of theatre, the thing that keeps me coming back late at night to put on another coat of paint. This is where the real invention happens. At our strike meeting there were choruses of “I want that one” in regards to the doors. I am happy to think that they will go to a good home – ahem – dorm room. I have staked a claim on the funky distressed window treatments, which I think will go beautiful in the distressing kitchen of my apartment.